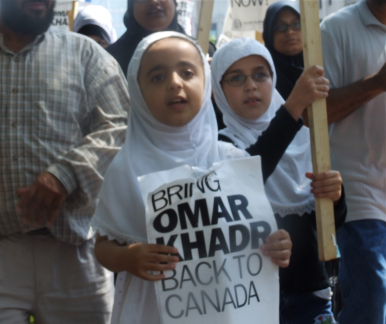 A girl campaigns for Khadr's return to Canada in 2008. Omar Khadr, a Canadian citizen, was captured in Afghanistan by U.S. forces in 2002, at the age of 15. He was accused of throwing a grenade that killed an American soldier during a firefight. Badly injured at the time, Khadr was shipped to Guantanamo Bay where he spent 10 years and suffered abuse and torture. He was eventually repatriated to Canada in 2012, where he has remained in prison, patiently waiting for his freedom. Amnesty International, an international human rights organization, believes that no one under 18 years old should ever have been transferred to Guantánamo, and that no Guantánamo detainee, let alone one who was a child at the time of his alleged crime, should be subject to a military commission trial. The Free Omar Khadr Now campaign has been advocating for Omar Khadr’s release and right to a fair trial. Human Rights activists and core team members Aaf Post, Heather Marsh, Afroze Ali and Helen Sadowski spoke to The Diplomat regarding Omar’s current status (the answers below are a collective statement by the four members of the campaign). What is Omar Khadr’s current legal situation? Last March, Omar had a two-day bail hearing at the Alberta Court of Queen’s Bench. His lawyers, Nate Whitling and Dennis Edney, requested his release, pending the outcome of the appeal of his Guantanamo “conviction” in the United States. The courtroom was packed with supporters for Omar. Reporters and other attendees shared the opinion that Omar’s defense had a much stronger case than the prosecutor. We are currently awaiting the judge’s decision on the bail application. If, contrary to our expectations, Omar is not granted bail, he will be applying for parole in June 2015. His attorneys have formally put the warden, David Pelham, on notice that he is obligated under the Act to make a security assessment of Omar. Both the Corrections ombudsman and Omar’s parole officer have recommended he be classified as a minimum risk. It is extremely troubling that the Canadian government has continued a pattern of challenging every decision favorable to Omar over the past ten years, which has resulted in millions of dollars in costs to the Canadian taxpayer. In 2014, Omar’s defense team was successful in persuading the Alberta Court of Appeal that Omar’s U.S. sentence was a juvenile sentence, and therefore he should be transferred to a provincial institution where he can access the benefits of the Youth Criminal Justice Act. The Conservative government appealed the decision of the Alberta Court of Appeal. The Supreme Court will hear the appeal on May 14, 2015. Omar’s Statutory Release is in October 2016. Being a Canadian citizen, was Omar Khadr given his due rights? If not, why? Omar is officially recognized as a child soldier by the UN Convention on the Rights of the Child and the Optional Protocol to the Convention on the Rights of the Child. As a Canadian citizen he was denied the protection of fundamental rights provided by the Canadian Charter of Rights and Freedoms. A 15-year-old should not have been locked up in Guantánamo. The Supreme Court of Canada ruled twice that Omar’s constitutional rights were violated and he should be brought home. The Canadian government ignored this decision and continued to be complicit in his illegal treatment. They refused to grant him a proper trial in a Canadian court when they were offered the opportunity by the United States. He was put through the widely condemned Guantanamo military commission in a show trial identical to those now having their verdicts overturned in the United States. The UN Committee Against Torture has called on Canada to honor its legal obligations to ensure that Omar receives redress for human rights violations that the Canadian Supreme Court ruled he has experienced. His treatment in both Canada and the U.S., and his continued incarceration have violated many laws and agreements both countries are obligated to uphold. From the first documentation we have on Omar in the leaked Guantanamo files, it is made clear that Omar is a political pawn, incarcerated only because of U.S. interest in his father’s associates and ignored by Canada for a political agenda. No one among the people who know him well, from the psychiatrists who examined him for hundreds of hours, to the Guantanamo officials who assessed him as a model inmate, has ever said he was anything less than an exemplary and kind, young man. The latest example is the family of his defense attorney who are not only willing to have Omar live as a member of their family, but have been working and hoping for this for years. What are Omar Khadr’s current activities and what does he plan to do once he’s free? Omar is very involved with completing his high school credits these days. While he is considered gifted in maths and sciences, Omar attends a prison school, which is set at the minimum level of achievement. The prison allows some assistance from volunteer teachers from Kings College University in Edmonton. Once Omar is released from custody, he will reside with his lawyer’s family and participate in the normalcy of household chores and family activities. He will be helped by community members to reintegrate into society. Omar will also continue his studies at King’s College as a mature student.